Email-borne insider threats both accidental and malicious are a real and ongoing problem for organizations. A recent commissioned study conducted by Forrester Consulting reveals many firms have experienced some form of insider security incident in the past 24 months. Download this report to get the findings. 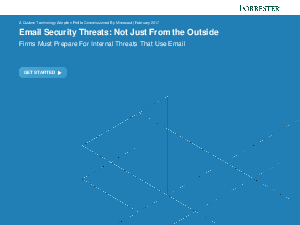 Discover Forrester’s perspective on internal threats and how organizations are responding and how they should be responding.